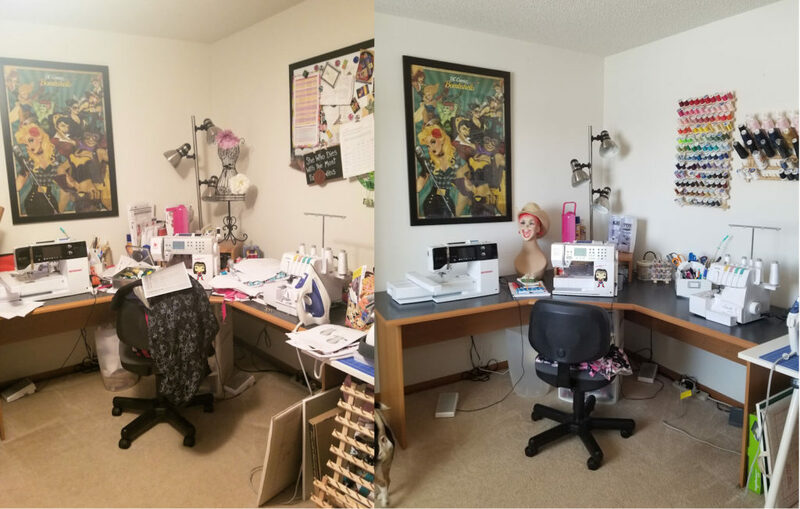 For the past week I’ve been talking about my sewing room overhaul and (thankfully) over the weekend I am done. The only thing I can say is that this looks like a complete transformation. I’d like to say that it hasn’t looked this good since we’ve moved into this house (11 years ago), but I’m pretty sure that it didn’t looks this good even then! 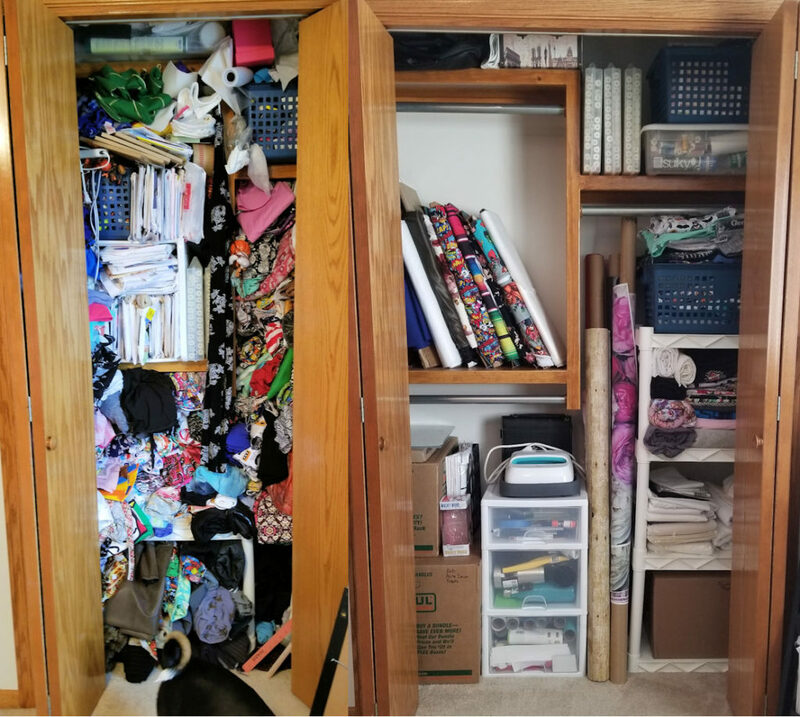 I wouldn’t be any fun if I just talked about it and didn’t show you the end results… so here’s some before\after photos of what it looks like now. 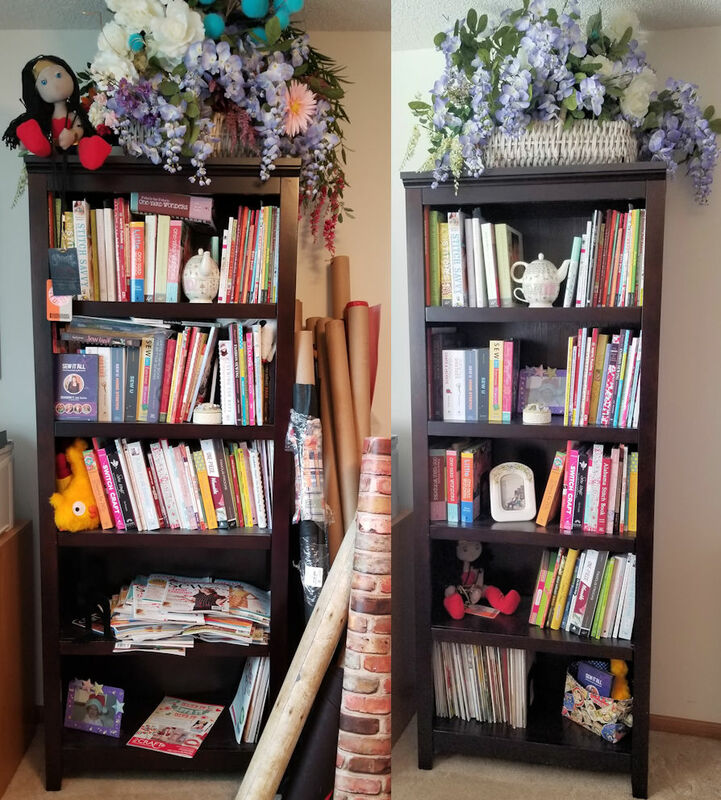 I started with the easiest first, the bookshelf. I took the photo after I had already removed all the Burda (Ottobre, Knip Mode, etc.) pattern magazines (I had about 200! ), but you get the idea. I also removed some books that I no longer use or needed. This rack was the second easiest cleanup. It had a number of magazines and patterns that I use regularly as well as buttons and toys. 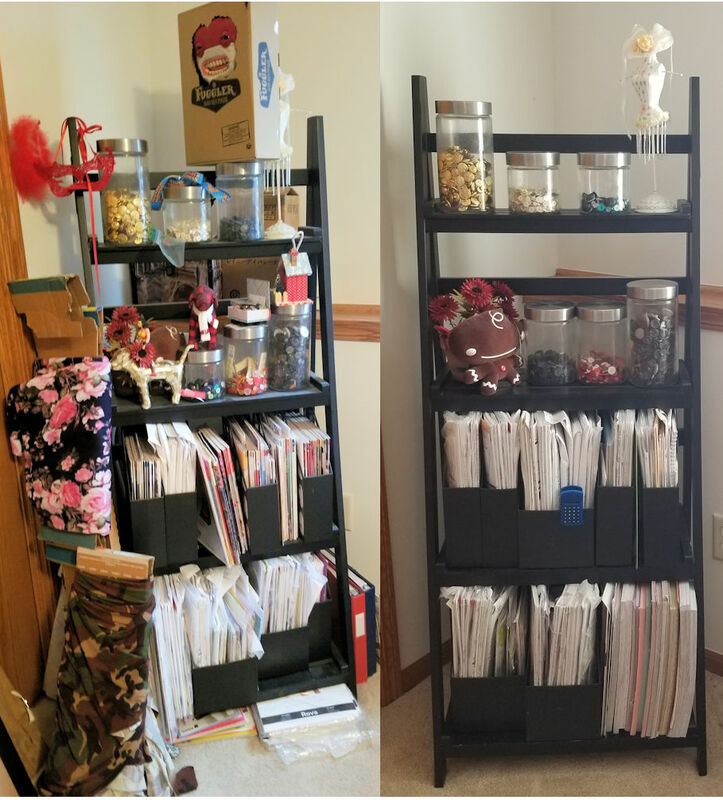 With the thread on the wall and out of the way, this left a lot of room to organize my sewing table. I removed some extra pincushions that I never move and cleaned up the WIPs that I had piled on the table. This, by far was the hardest part to go through in my sewing room. Part of it was the sheer volume of what I was working with, but also because it seems as if all my fabrics told a story (I talked a bit about this on Friday). But once I got started, it was easier to let go and what I have kept are the things that I will use at some point. I even had enough room in there to store accessories for my Cricut, rolls of fabric, and put a few of the bulkier materials on bolts. I’m calling this an impressive feat, if I do say so myself. Last, but not least is the “Cutting Table,” but I’m not sure that it’s actually been used as a cutting table in YEARS. It became a warehouse for WIPS, fabrics, projects… you name it. I also found myself stashing more fabrics in a basket underneath…. it was just a mess. After going through the fabrics, clearing up the projects and removing the clutter, I now have a workable table again. And there you have it. This took longer than any sewing project that I’ve tackled in recent years, but the reward is huge. 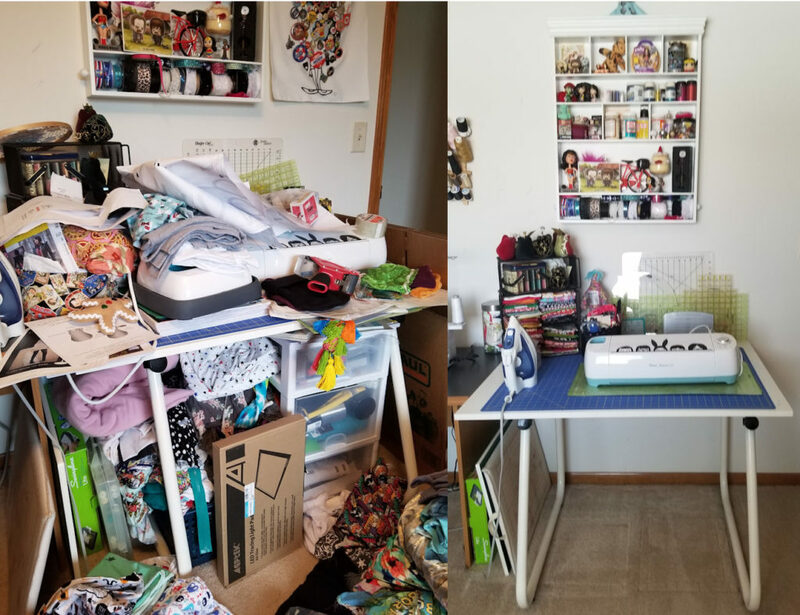 I’m vowing that I will not add any fabrics for several months (unless they will be used immediately), I will keep the room clean, and I will never let it get this out of control again! With that said, it’s time to get back sewing – it’s so much more fun to do when you have a workable space! This entry was posted in Uncategorized on January 21, 2019 by stacy. I see you have a cricut easy press….I have been wondering if it would be possible to use one to cut down the amount of time needed to fuse interfacing for bag projects. Have you ever tried it?